We put on a really great show. Come and see us sometime! Who is THE GRAND RAPIDS CHORUS OF SWEET ADELINES? Grand Rapids Sweet Adelines Chorus under the direction of Denise VanDyken, Master Director is the 2018 Region 17 Overall Champion Chorus and Division AA Champion Chorus, and 2015 International 5th Place Division AA Medalists. Watch us on YouTube! 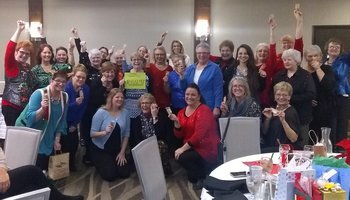 Grand Rapids Sweet Adelines is more than just an a Cappella ensemble - it is a family. We love getting together each week, and sharing friendships as well as great music. Visitors and singers interested in auditioning are always welcome! We rehearse every Monday (except Federal holidays and as posted) from 7 - 9:30 pm. If you are a woman who likes to sing, you're invited to visit Grand Rapids Sweet Adelines and discover the joy and health benefits of singing! Sitting in on one of our rehearsals is the perfect way to find out more about us, and what we can do for you! Want Grand Rapids Sweet Adelines to sing at your next function? 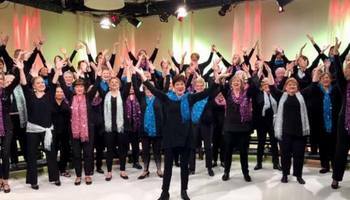 Why not hire Grand Rapids Sweet Adelines to entertain at your next event? We can perform at corporate functions, charity events, community Entertainment events, birthday parties, christmas parties, awards nights, weddings, engagements, anniversaries, engagements, and even funerals and memorial services.